For you, what’s it all about? with reference to the field of photography and your practice in it. For me, Photography in all its forms is a beautiful way of expression and to show someone exactly what was going through your mind the precise second you snapped open the shutter. Cartier-Bresson’s notion of the decisive moment is of the utmost importance for me as somethings just cannot be recreated in postproduction, although the Photoshop and CGI boffins have pretty much nailed it! Photography will always have a place though I feel. I shoot both commercially for clients and project work for myself and what I try to do is convey my ideas through the imagery and my passion for image making. Can you supply 3 images and tell me something about why these ones. (favourite ones, significant ones). I’ve selected 3 images, each with a significant point in my life, career and train of thought. Something of the past, present and future. The first photograph I ever took, which I talk about very briefly in the biog on my website, was when I was 8 or 9 in Venice with the guidance of my mother and her old Kodak 110 Ektra. Standing in the middle on one of the amazing bridges looking straight down one of the canals, the buildings all very characterful , decrepit, historic and significant is actually a memory I can still remember incredibly well, I remember that I lined up the shot perfectly centered on the bridge with the buildings all lining up symmetrically around the canal and a little blue sky to the top of the frame. The water was remarkably busy with gondolas and the sides of the buildings messily dressed with ramshackle steel balconies with hanging washing drying in the sun. The concrete of the houses was dirty and decaying. Although this photograph is lost to many a house move or may never have even been developed, the memory of this image is burnt into my brain, although, it only came to significance to me a few years ago when I was thinking about how things started. I have always been fascinated with the scene of a city, the architecture, a lot going on, a human element, symmetrical in form, but a sense of something else going on that you can’t necessarily see. I realised the way I took the image in Venice is pretty much how I look at taking a photograph now 20 years on! It is unfortunate I cannot include this image as I could draw upon many comparisons with with many of the projects I’ve done over the years, through college and beyond. prospectus work was never going to get me excited at that opportunity after what I was looking at in Uni. As with all BA graduates I thought I deserved better so I started ambitiously sending my college work out to people. After a few weeks I got an email back from Robert Thiemann, the editor of Frame Magazine in Holland to which I massively admired in design and photography though strictly an architectural publication aimed at the more creatively minded, congratulating me on my work and comparing it to that of Andreas Gursky! and offering me a possible editorial. I was amazing and of course accepted even before hearing what that project was. I didn’t know it at the time but it turned out to be the most important 10 shots I would take, The job was to shoot the new Selfridges Manchester store for a 10 page feature. Didn’t seem much at the time but Selfridges’ Press office had caught wind of this and eventually called me down to London for a meeting to discuss a project also, that turned out to be a few shots of the ‘not yet open’ Saatchi Gallery on the South Bank. 7 years on I still shoot projects for Frame Magazine and Selfridges every month. The image below was the first image shot of the Selfridges store in Manchester, published in Frame in October 2002 and in Creative Review later on. It still remains in my portfolio today and probably forced my hand in moving to London. Off the back of that work I have shot for Chanel, Fortnum and Mason, Hermes, Elle Decor Italia, Kurt Geiger, Mark Magazine, worked on a number of internationally published booksand magazines including Vogue and Harpers Bazaar. Though all the commercial and editorial photography work has treated me very well and helped me take serious steps up in the world I needed, and I guess, most importantly the money to keep on going and living, I always thought there might have been more to what I was looking for out there. In college all I had done was make photographs that pleased me and fitted my projects, so leaving that bubble was a great challenge to make work that had a use, whether editorially, advertising or promotional, it was always for a tailor made purpose. The pros to this was always when something got published – the idea your work can be seen by thousands of people was mind-blowing and therefore had to be in itself very well done to catch an eye or two which I always tried to do to get that all important foot in the next door. However, what was missing was the release of creating my own projects, the creative freedom to experiment and explore. I wanted to get back to my old way of thinking. I tried a few ideas, touched on a few projects but nothing caught my imagination long enough to last more than a couple of shoots. It wasn’t until 2008 when I was in Chile for a friend’s wedding and also shooting an editorial out there at the same time that I realised what I was actually missing, I had never been travelling after college unlike many of my friends, choosing instead to slog my guts out consistently for 6 years in London. I was stale, and I needed to see a fresh perspective and to start to think again. I used the 4 weeks we had out in South America to travel around villages, climb live volcanoes, explore the vast cities, talk to the people and eat a hell of a lot of steak! All with my Hasselblad strapped round my neck. I documented all that 60 rolls of 120 could while I was there. The image above was the view from the window in the first place we stayed in Santiago, Chile. Everything was surrounded by the Andes, it was great and just what I needed scenery wise as London had gotten so samey. Fresh from buying Alec Soth’s photobook Dog Days in Bogata, I realised it was a similar path finding for me in Chile – this was to be my project! Something to get my ideas flowing again and my inspiration for a fresh perspective. 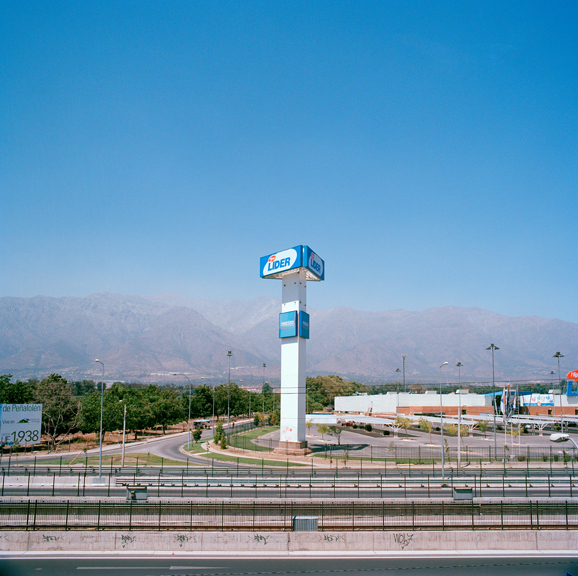 Images from this series ‘Excursions’ were Longlisted for British Journal of Photography’s projects assistance award, the Terry O’Neil award and exhibited at London’s Photofusion Gallery and the PM Gallery in group shows. To represent the future of my work in brief will be to carry on with a project I was initially commissioned in 2009 to create by OnOffice magazine on a slaughterhouse as a notion of a workplace. I stumbled upon a place in Coventry who very kindly allowed me all access for the day, what a day, the things I saw! 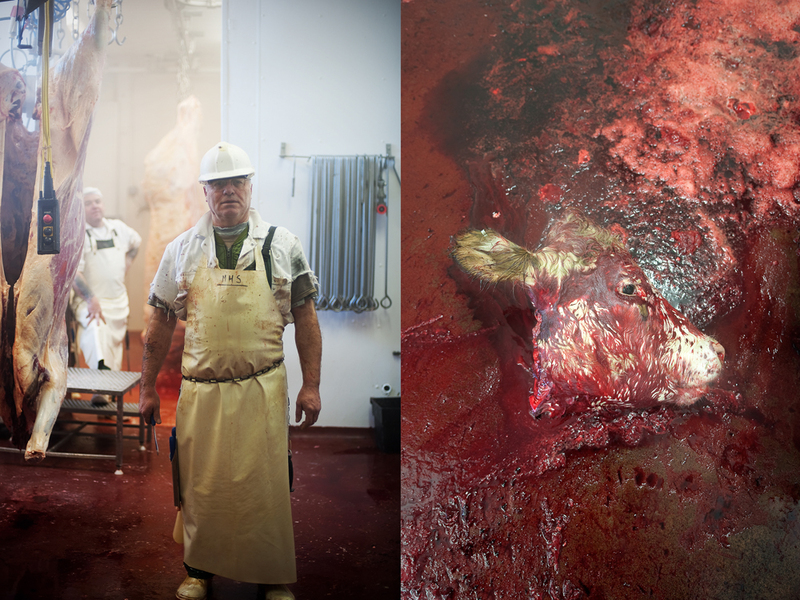 Images of this project ‘The Slaughtermen’ have been published in OnOffice in Feb 2009, Longlisted for BJP’s project assistance award, category winner and Best in Book for Creative Review’s Photo Annual 2009 and will be exhibited at The Printspace Gallery in October 2009. Photography can make you scared. It’s almost akin to being in a running race. Can you comment on the demands, the fears of being a photographer? I’m not necessarily scared of photography, I used to be because of the constant competition and fight for a job, but now I feel relatively secure. In these very difficult times of financial mess everyone is in, its hard not to be a little anxious as to where your work is coming from and the ever dwindling shoot budgets I think all you can do is put into a shoot all you have to offer and give the clients a reason to remember you by. My ethic right from the start was to go the extra mile, explore all avenues of work, I no longer specialise in architectural and interiors work but also in portraiture, landscape and product photography. I think diversity is the key. I think these days it seems easier for a client to use one trusted photographer who can shoot everything they may need within their budget rather than one guy who specialises in just one discipline. It’s the reason a lot of people are currently scrabbling for work. Another important note of key is to keep incredibly proactive and prominent in peoples thoughts. I’ve never stopped working hard ever since I became freelance. Photography can very much be like a race in many ways, but I see it more like running up to the top of a block of flats, with each floor you get to, there is another one, and then another after that, and you have to be patient and full of stamina to get to the top. Somewhere I hope to be one day! Everything! I don’t think my personality will ever let me be finished as there is always something there to strive for and to give my all to achieve. I would love to work in New York on commissions and shoot projects in China, Hong Kong, Japan, Russia, Cuba, Iraq…..I could go on! But ultimately I see a step up being advertising work. A lovely fine art book of my project work wouldn’t go a miss too! Do you have any regrets in your life as a photographer? Anything you wish you’d done differently? My regrets are not coming to the conclusion that I needed to think hard to create a project, sometimes taking a step backwards will reveal the full picture and its no good hoping the answers will come from someone else, you don’t get anything for nothing. Travelling through South America helped me realise some of this and entering competitions was something that only came to me a few years ago – ‘you gotta be in it to win it’. 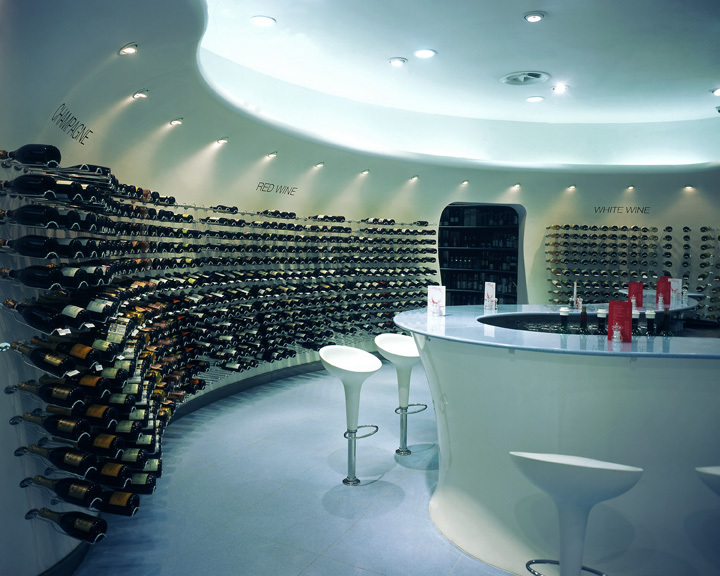 Great stuff – another fine Falmouth talent. Nice one Meredith! I couldn’t work out if your pictures really did look that good or it was just cos I was looking at them on my shiny new macbook. Form over function.. its a debate I think on often. some might say style vs substance .. I’ve always known your love of images means you go that extra mile and you seem to have transcended the rather mucky waters of that argument. When I visit photography exhibitions I’m more often than not left so unmoved by the detachment of the photographer from the subject..I am bored and dissapointed. Your work is really on a path to great things. How and why some people are able to take a mecanised tool and translate something of their objectivity/subjectivity through incredibly subtle but telling means. Are we (as photographers) taking any subject and making it in its own way beautiful? Not necessarily aesthetically pleasing..(a beheaded cow) but in its own way an image of intensity..a powerful image in the same way the Chile and Sefridges pictures are images that invoke emotions..and have their power too although polar opposites of violent death they display great control of the medium but also a love of the subject.
. Thats your range now.. diversity as you say.. your able to translate across languages and make ‘it’ tangible.